Turn a single Magento® user account into one with multiple sub-user accounts and grant advanced permissions to each user. Choose from five different permission levels to give users access according to their role in the business as well as the ability to send cart for approval before being able to complete a purchase. Why would you need a Multi User Account? If you’re looking for a way to have multiple users and sub accounts under the same master account, but with different user permissions, look no further. The Multi User Account extension has everything you need to create and manage sub logins under a single Magento® account. Once a subaccount user adds items to the cart, based on their user role, and subaccount permission level, they will need to send the cart for approval prior to purchase. The subaccount extension is perfect for creating employee accounts with company logins. The Magento® Multi User Account Extension turns a standard Magento® customer account into one with multiple users and sub accounts with different levels of access permissions and unique logins. It creates sub-accounts under a parent customer account (main account). This multi-user extension is the perfect solution for companies that own a B2C or B2B Magento® online store and need to create one account with multiple users. 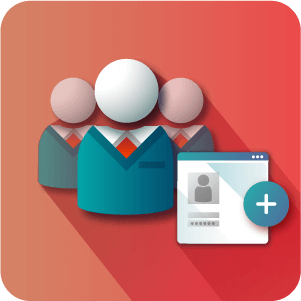 Companies can control user roles, advanced permissions, and limit sub-user access and abilities. For example, one person could be granted the ability to buy merchandise, while another can only view orders and customers, and so on. 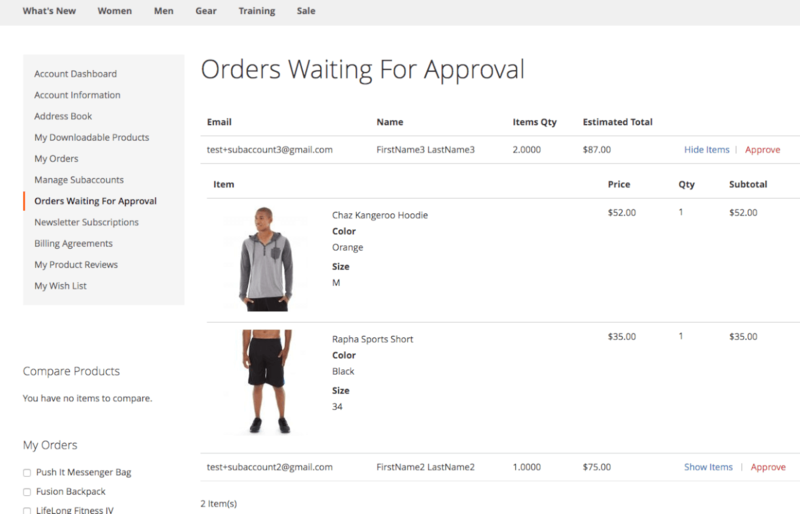 One of the most important features is the ability to send orders for approval. While a sub account user can add products to the cart, they'll need to get approval from the account owner to purchase. This functionality depends on the sub account user permission as set by the account owner. Order Approval – Request cart approval from the account owner depending on user role before being able to complete purchases. Needs Approval – User can add items to cart, but account owner must approve them. 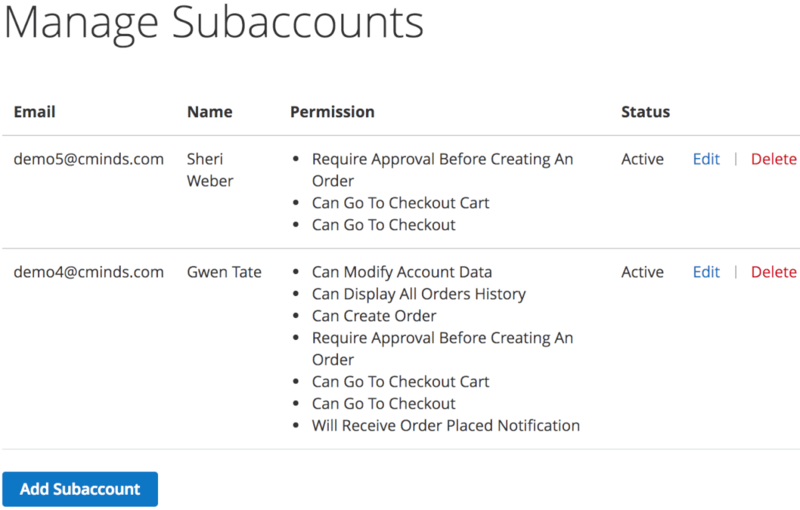 Access Cart or Checkout – Define if the sub account can access cart or checkout. View Account Orders – Define if the sub account can view all account orders or only their sub account orders. Notifications – Define if sub account will receive the orders / shipping / invoice notifications emails when they create an order. 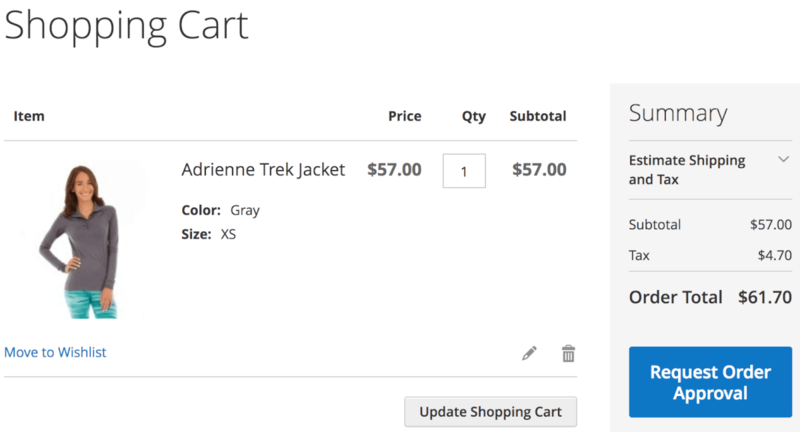 Viewing Cart – Set sub-user to be able to view/not view the cart. The account owner can see sub-user’s cart. Order Approval – Request order approval from the account owner. How many sub-users can a customer have on a single Magento account? There is no limit to how many sub account users are assigned to one Magento account. Just be mindful of the capabilities of your hosting package if you are intending to have many many users and sub account users. Who would benefit from using multiple Magento sub-accounts? Ultimately, the extension is for companies and corporations which may be employing different people for purchasing equipment and supplies, and would like to keep track of who buys what. It is also useful for accountants and managers that need to view the monthly expenses of the company, and for administrators to supervise those purchases. The majority of sites using this Extension will be B2B but there are plenty of B2B site applications as well. Who can approve sub-users' order requests? The first answer to this is, it is possible to set a sub account user’s permission to allow them to create orders themselves. Then of course the Parent user of the sub account user or the administrator can approve their order request. We have also included a feature that allows either the store admin or the parent user to delegate sub user approvers, who are sub users with permission to approve other sub users’ order requests. There is a lot of flexibility in who can or cannot approve orders trickling down from the preference of the Admin. To learn more about sub user approvers check out this Help artice. Does the extension send email notifications for new order requests? If so, who receives them? Good question. Yes. There are email notifications sent when new order requests are submitted by sub account users. Who receives them depends on the configuration set by the administrator. Either the Master account, the subaccount approver with the closest approval limit or both the master account and the most suited sub account users will receive a notification. To learn more about notification emails, read this Help artice. Does the extension support API methods for creating/managing sub-accounts? Some code fixes were added. The fixes to the Sub Account form were added. The fix for order approval limit on the checkout page was added. “Manage Subaccounts” tab is now active, when the Master Account tries to edit the Sub Account’s data. 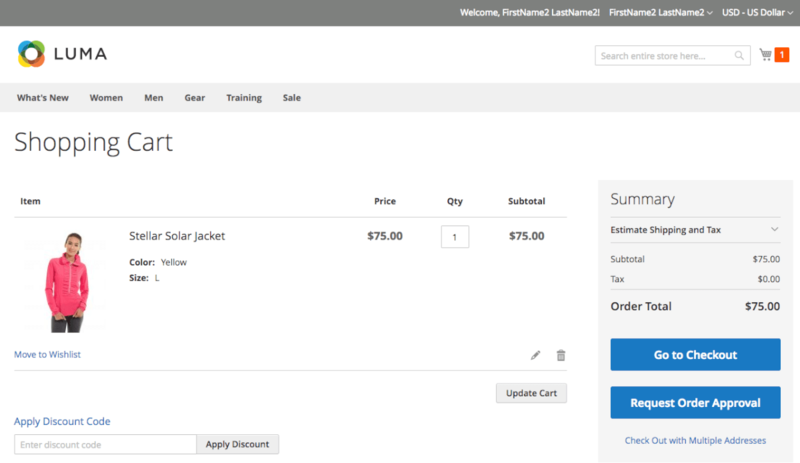 Now the Sub Account’s allowed threshold for creating the order is validated not on the cart page but on the checkout page. The issue “No such entity” for the Sub Accounts is fixed. The issue with displaying Order History is fixed. Some little code fixes were added. The new feature is added. The nested accounts. Now you have the ability to create the hierarchy of third and higher levels. The parent account for the sub account of n-th level will be the sub account from the n-th – 1 level. Bugs with order authorization are fixed. 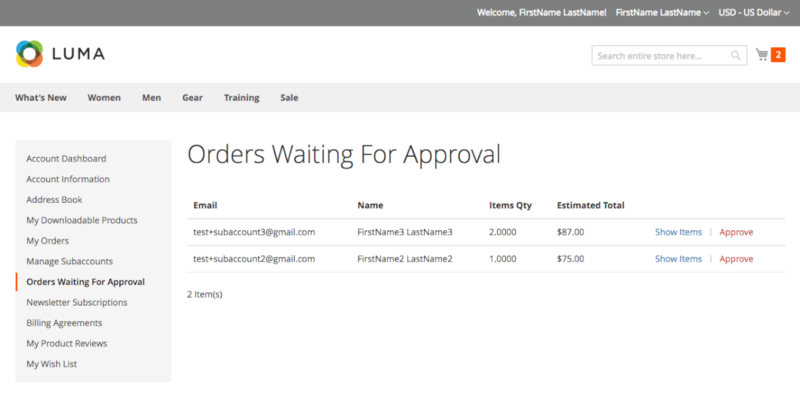 The order history in “My Orders” is displayed correctly on the customer page on the frontend. If “Can View Orders” is set to “No”, then the sub-account still will be able to go to the “Order History” tab but won’t be able to see any orders there. 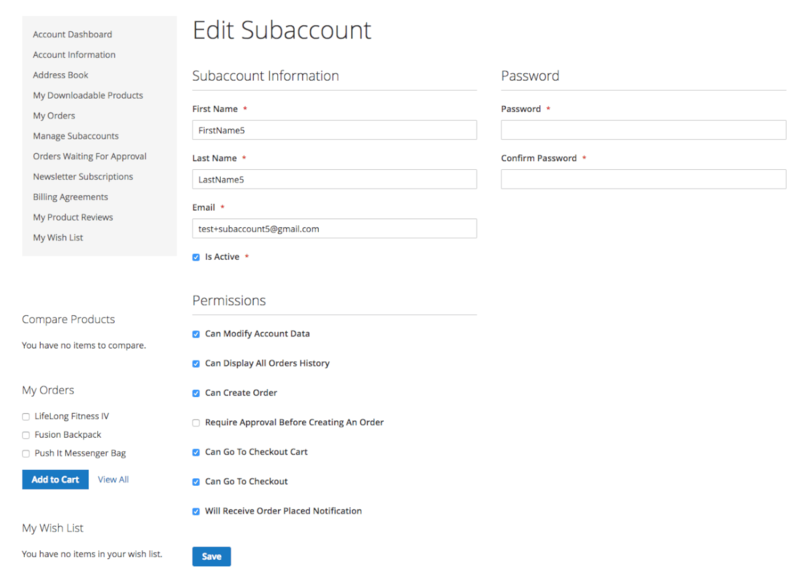 Added ability to modify parent account of the sub-account on the customer admin edit page. Some little code fixes are added. If the option “Force Use Parent Account Details” on the admin side is enabled, then you are not able to manage the options: “Force Usage Parent Company Name”, “Force Usage Parent Vat”, “Force Usage Parent Addresses” on the frontend. They will be enabled by default. Now extension takes into account the configurations on the admin side regarding customer’s attributes (all fields are now rendered on the admin side as well as on the frontend) and it sees also whether this attribute is optional or required. 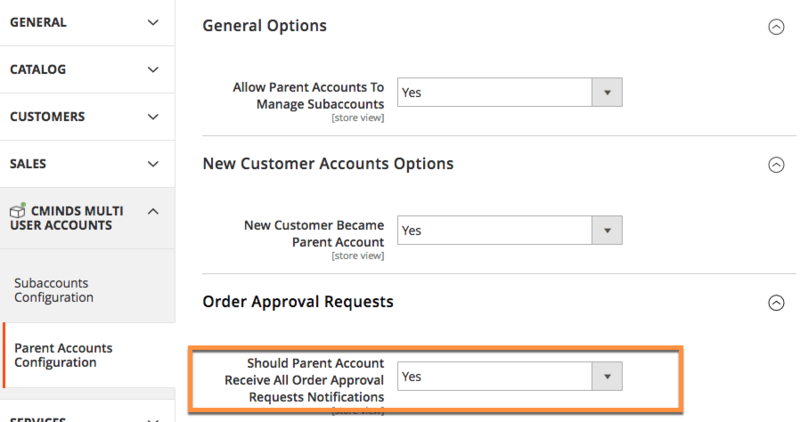 Feature: the option in the “Parent Account Configuration” -> “Order Approval Request” -> “Create Order After Approve”, which allows to create the order right after it was approved by the master account. The payment method and shipping method in this situation can be configured from the admin side. Fix: displaying data about the master account in the placed order on the admin side in case the subaccount creates the order with the enabled “Force Usage Parent Company Name”, “Force Usage Parent Vat”, “Force Usage Parent Addresses” options. 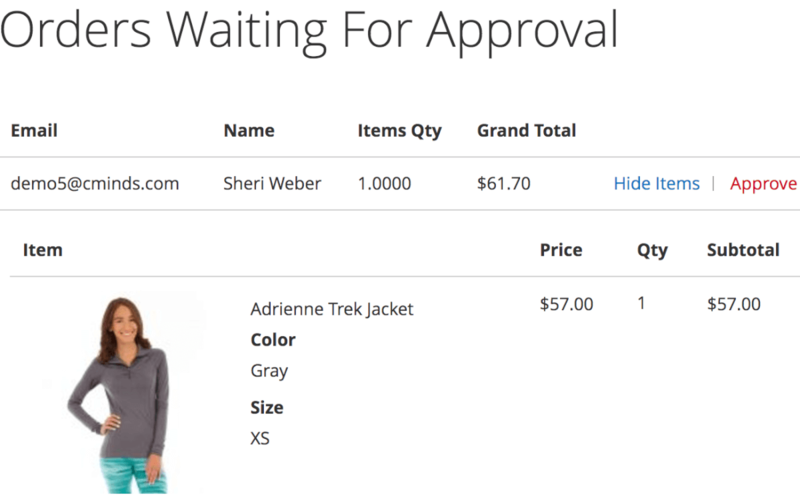 Fix: displaying data in the list of “Orders Waiting For Approval” if the “Shared Session” option is enabled. Bug fix: when the order was created on the admin side with the checkbox “Email Order Confirmation” unset, the email was sent to the customer in any way. This bug is fixed. The field “Order Amount Without Approval” is visible only if the option “Require approval before creating the order” is selected for the sub account. A comment “The customer’s property ‘Can manage subaccounts’ will be set to ‘No'” was added under the option “New Customer Became Parents Account”. Fix issue that error message was displayed saying that subaccount can not edit account data after first login. Fix issue that parent account was unable to view order details when he has no subaccounts. Ability to view order details by parent account for orders created by sub-account has been updated. Ability to view order details by sub-account for orders created by parent account or any of his sub-accounts have been updated. Force parent addresses permission has been updated. Our core extension has been integrated. Issue during account creation on Magento versions below 2.0.2 has been fixed. Issue that parent account name was in the order place notification for sub-account has been fixed. New configuration option to force a parent account name and email in order details instead of sub-account has been added. Rest api has been updated. Soap api has been updated. Force parent account addresses permission has been updated. Ability to reject order approval request with ability to provide a reason has been added. Parent account can always approve order approval request even if it is not authorized. Issue with logging in has been fixed. Admin layout issue has been fixed. Added Descriptive Error logs in API response. Master account is able to enable/disable sub accounts even though they cannot change the name / email of the sub account. Granted access to my account addresses for Sub with address inheritance turned on. 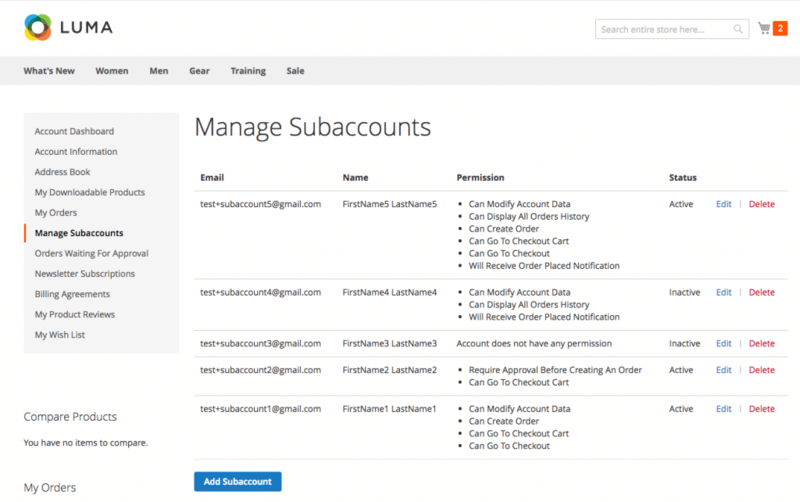 Global ‘Can manage Subaccount’ is possible to override by customer specific setting. Global setting New Customer is able to create Sub accounts – fixed bug. Subaccount is not created if no address is passed – fixed bug. Link old parent / master as a sub to new parent. Approval request notification is sent to parent account only if option is enabled in configuration or there are no other matching sub-accounts. Module configuration has been moved to separated tab. Order approval requests authorization before approval feature has been introduced. Introduce new configuration for sub-accounts which allows to set order amount below which approval request will be not needed. Email notification about the new approval request is sent to sub-account which is closest in the range and to the parent account. Admin configuration value management has been refactored. Additional configuration values are displayed in the sub-account grids. Fixed error and security issue when someone manually typed sub-accounts manage url not being logged in. Fixed checking if customer/sub-account is enabled/disabled during logging in. Fix infinite loop which happens in some circumstances during password recovery. Setting default can manage attribute for new customers update. Can manage sub-accounts permission check in the parent account dashboard update. Manage sub-accounts view updates. Add new sub-account button and ability to edit or delete sub-accounts are not visible if the parent account do not have the ability to manage sub-accounts. Add custom API for managing extension Parent and Sub accounts. New permission has been introduced which makes that sub-account gains ability to approve other sub-accounts waiting for approval orders. 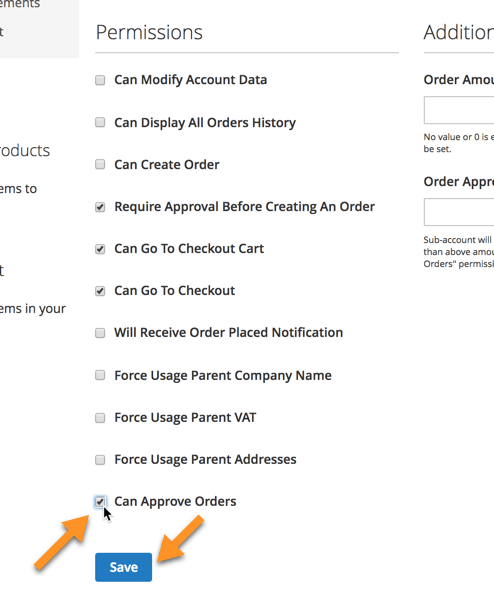 Can approve permission came along with the ability to configure the top order value which particular sub-account can approve. Depends on the can approve permission, sub-account can gain access to waiting for an approval orders section in his dashboard. Console log improvement for import command. During parent and sub-accounts creation in import process welcome emails have been disabled. New permission has been introduced to force parent account company name usage for sub-accounts. New permission has been introduced to force parent account, vat number usage for sub-accounts. New permission has been introduced to force parent account addresses collection usage for sub-accounts. Ability to import parent accounts with their sub-accounts has been added as a new cli command. Ability to generate sample sub-accounts import file has been added as a new cli command. Compatibility fix for Magento 2.2. Checking if sub-account is confirmed when only sub-account email confirmation is enabled. Fix admin side subaccounts creation, form fields values are remembered if saving process will fail. Fix issue that parent customer id parameter has not been passed properly in the admin subaccounts creation form when the saving process fails. Fixed minor issue which occurs during customer account confirmation. Fixed issue that newly created subaccount has been assigned to different customer group than parent account belongs to. Email confirmation will be required for the subaccounts as long as the option is enabled for customer accounts. Fix issue with tax/vat number required for creating new subsequent forms. Add correctly exception message when subaccount email exists. Some event observers have been moved to global area. Assigning newly created order and quote to subaccount which has been created through admin panel using reorder functionality. Assigning quotes to subaccounts fix. Pagination fix for customer my order section. Some event observers have been moved to the frontend area. Implement permission to receive order placed notifications. Fix order approved request notification. Order approval permission behavior has been updated. Redirect page layout has been updated. Order approval status update after cart changes. Minor bug in the customer dashboard has been fixed. Minor bug in email template has been fixed. Permission check during redirect to a success checkout page has been updated. Add separated acl resources for manage subaccounts and extension configuration. Hide request order approval button in cart when order has been already approved. Hide proceed to checkout button in cart if order requires approval first. “Back” button in admin subaccounts edit form redirect us to the proper page. Minor bug in customer dashboard order history has been fixed. Customer dashboard recent order has been updated. New “Parent Customer” column in the customer grid in admin panel has been added. 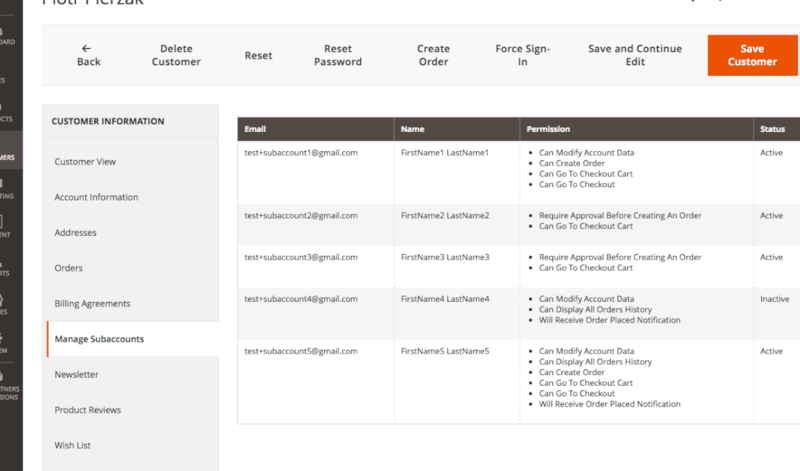 Ability to add/edit/delete customer subaccounts in admin panel has been added.